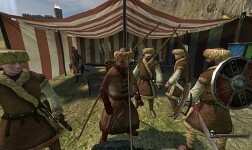 Up to 8 castle owning factions (which native multiplayer calls teams) and two extra categories: commoners, which is for players joining the game, changing between the main factions, or who want to play alone, and outlaws, which players who repeatedly kill team members in a short time are restricted to. Troop types are not selectable before spawn: you need to pay money and train for a certain amount of time with one of the factions. Some troop types have special abilities, like engineers for building, doctors for healing, brigands best at lock picking, and serfs for the dirty work. Troop type, faction, gold, and more are saved every few seconds and restored when rejoining the server, until the mission ends or the server crashes; all data is wiped at the start of the next mission (map / round / game / whatever). Enhanced item buying scene props, which combine buying, selling, stockpiling, and crafting; showing the item stats. 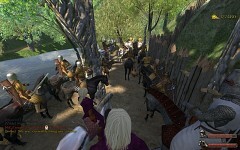 Most weapon, armour, and horse stockpiles require crafting by engineers from resources before they can be bought from. Destructible trees and mines to harvest resources; trees regrow after being cut down, and mines respawn after longer periods. Systems for gathering food, which is a requirement for healing by resting at a bed: fishing, growing wheat for making bread and beer, grapes for wine, and animals for meat. Animals can be herded and butchered with the appropriate skill, which gives meat for eating and hides to make leather for crafting. 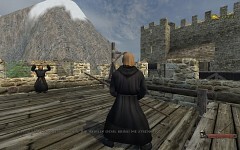 Repairable and buildable scene props, like doors, ladders, walls, and bridge s. Doors can be locked, able to be opened by players in the correct faction, and able to be lock picked by others. Improved moving portcullises, drawbridges, a new ferry boat, and a lift platform. Doors which teleport players to the location of the other linked door, so the native interior meshes can be used, underneath the terrain. Ships that can be sailed, ideally with two players; they can also be damaged, repaired, and sunk. Castles that can be captured, which changes the door locks, flags, and more. Castle faction lords, which are players voted in by a faction poll; they can set the faction name, banner, withdraw money from the castle chests, access a unique troop type, and give door and chest access permissions. Money bag items to transfer gold between players. Loot bags are dropped when a player dies, taking a small amount of their gold, and all weapons should be dropped. The ability to loot armor off corpses for a very short time after their death; approximately 30 seconds. Various carts and chests which can be used to store weapons, armor, and other items in; different cart types can be attached to either to horses or player characters to move them around. Some ships also have a hold for storage. Player invulnerability for 10 seconds after spawning (you cannot attack or be attacked). Doctors can heal badly injured players up to a limit of their skill, while resting on beds is for fully healing lightly injured players, using food. Outlaw ratings for players which are increased by team killing and decrease slowly over time. If a player's outlaw rating is too high they are set to the outlaws faction, and when they die they can only train as the available outlaw troops until their rating drops low enough. Various messaging systems for chatting to players nearby, in the same faction, or any server administrators connected; with a toggleable overlay to show the last 11 lines of local chat. An optional feature to use an external web server to restrict player names and clan tag prefixes to specific player serial numbers, kick players using invalid characters in their name, and to set specific permissions to admin tools for each player. One name server could be used for multiple Warband PW servers. More ways for scene makers to adjust how the game mode works by setting edit mode scene prop values; things like associated castle, gold value multiplier, linked scene prop, initial state, initial hit points, scene time of day, and which factions are available. Here the new version 4.3. It has been up on the official forum since a while now, but i would like to apologize for not being able to put it beforehand. Otherwise find the change log below and the full download in download area. Add a "feudalism" game type where exporting only transfers to the castle chest, and resource stockpiling is free. Add a "permanent death" game type where dying resets to a peasant commoner with no money. Replace the scene prop hit points bar with a new custom system. Convert another native ship mesh to be sailable (ship_b). Enable filling item chests with preset load outs at mission start. When discarding armor with the action menu, drop it in a static item container, like the corpses when killed. Darken the chat overlay background, for better text clarity with some faction colors. Increase resource values for wood and iron items, making repairs more efficient. Increase the amount of salt stored in a sack; add a stockpile for excess salt piles. Increase the amount of wheat and grapes per harvest cycle, reduce resource requirements for wine making. Increase the amount of meat and hides from some animals. Make multiple animals move when using a herding staff, depending on skill. Reduce herd animal hit points. Make fish schools more likely to cause ripple effects or splash sounds. Reduce fish school movement speed. Construction boxes that can be used to cover other stockpiles or training stations until built. Enable setting rotating doors to start the mission destroyed. Reduce engineering skill to craft a hunting crossbow from 3 to 2. Tweak the flax plant shader to make them show up properly in "DirectX7" (FFP) mode. Set some values needed for the herdsman troop to work correctly, forgotten when first added (respawn health and stats chart ordering). Don't subtract 1 from player kills when it was a member of a friendly faction. Allow setting the initial amount for burnable wood heaps. Fix a bug in the crafting reward calculation script. Increase the damage dealt by the admin tool to kill a player, just in case. Make the admin panel default to the current game type. Name server: implement pagination for the player names list. List castle names with numbers in the editor. The mod is good and can be fun. But, a lot of the servers are run by complete tools who break their own rules, or allow their friends to break the rules. E.g., Fighting off and killing 3 would be robbers, who then come back to life and revenge kill me (which is supposed to be a ban). They claim they were robbing me again, though no words were ever spoken. I have the recording, offered it to the admin to prove they were lying. Admin refused. They attacked me again, I killed 2 before the 3rd cut me down. They cried to the admin and said I tried to revenge kill them. Offered recording as proof they were lying, again, and admin refused. I was banned. Almost every server is the same. Sounds very corrupted... i'm going in.